Something a bit fishy! I adore the By the Tide stamp set and couldn't wait to get it into my paws. It's another one of those fabulous sets that you can stamp and overstamp to create scenes and the stamps are so fantastically detailed! I started by stamping the text stamp in Crumb Cake ink all over a piece of Very Vanilla card stock and then used the other stamps to build up the scene. 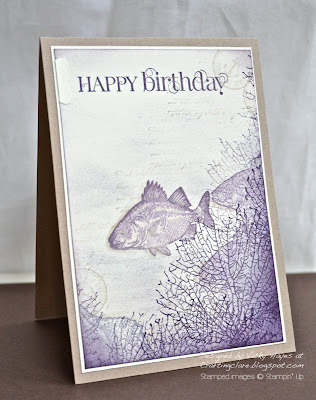 To get more of an underwater feel, I sponged the Perfect Plum ink very, very lightly over the card stock using a torn paper mask. Mr Fish got a whisk-over with an aquapainter and then detail added with markers. I thought this sentiment from the ever-popular Curly Cute set was suitably frondy! I drew attention to it with a little tab made with the Petite Curly Label punch that's available free as part of the Sale-a-bration promotion. Whenever my children look as if they need a bath I always refer to them as 'the creature from the black lagoon'. This comes from an antiquated film I saw once and I've included a trailer below for your amusement. This is beautiful! What a great scene. Thanks for joining us at CAS Colours & Sketches! Gosh Vicky!!!! That's a FAB stamp set!!!! WOW! Love this so much and already see it being ordered by me too. Such a beautiful card! I STILL think I have nightmares about that movie! LOL!!! Morning Vicky, LOVE this card and so would my youngest as he is fishing mad! The colours you've gone with are beautiful, I love this combo. 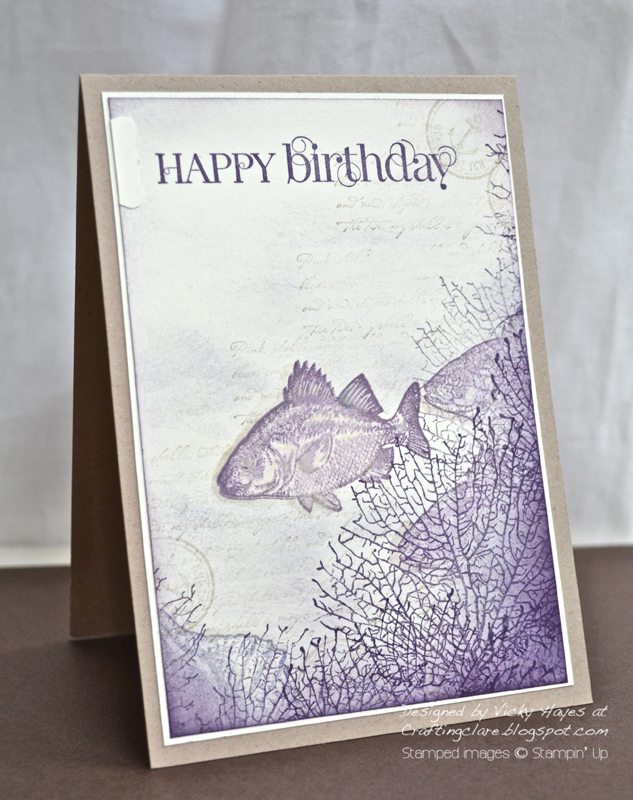 Firstly a brill card,love the fish in the weeds too.